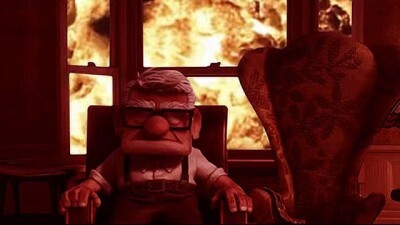 Up is well known for tugging at your emotional heartstrings, especially in that bittersweet opening sequence that sort of overshadows the rest of the film. So what if Michael “Explosions” Bay, known for cinematic fast food like the Transformers franchise, directed Up instead of Pete Docter? The result would be something like this fan trailer by YouTube user MrStratman7, which makes Up seem much more epic and action-focused than it actually is. And naturally, there are explosions — tons and tons of endless explosions. In fact, keep watching after the title appears for one final explosion.